Stampin Up! Gorgeous Grunge Meets Petite Petals. Ok, I admit that until recently I had not understood the charms of Gorgeous Grunge. Far from it. In fact, I must be the only Stampin’ Up Demonstrator I know that had not fallen under its charms! I don’t know if I have seen a particular project, or perhaps I am just seeing it differently, but I have fallen hook, line and sinker. The stamp set arrived this afternoon and I have already made two projects with it. Two pieces of Whisper White cardstock sandwiching a piece of Rich Razzleberry, which is such a gorgeous deep red/pink colour. I always cut my mats a quarter of an inch smaller than the card it sits on. Than I stamped the two images in the background with Old Olive and Rich Razzleberry using two of the stamps from Gorgeous Grunge. Old Olive is a lovely neutral colour and a great foil for a splash of colour. 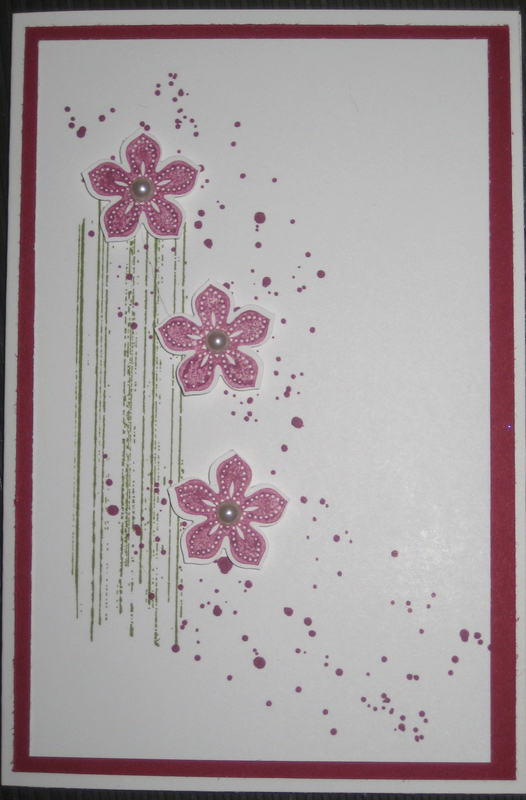 My favourite flower from the Petite Petals stamp set was stamped off three times in Rich Razzleberry. 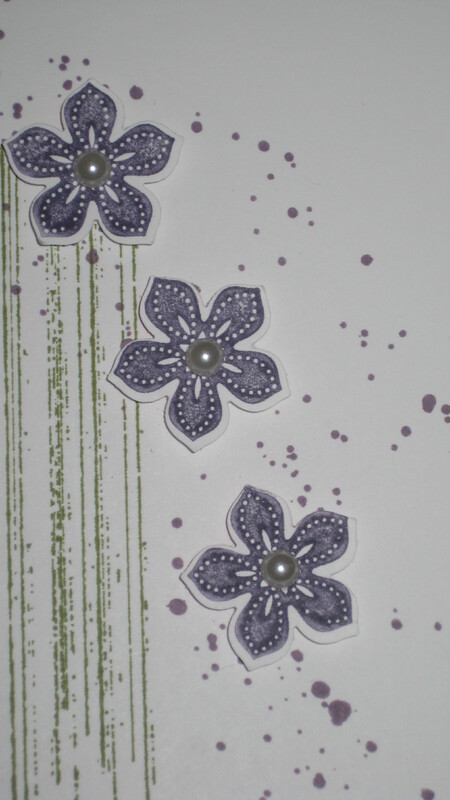 These were punched out using the co-ordinating Petite Petals punch and then set off with one of the large pearls from the Basic Pearls and then popped randomly on the card. If you want to see the video, click here, but be warned, there are a couple of bloopers. This is the same card, but with Old Olive and Perfect Plum inks. Rich Razzleberry card stock and ink. If you have any questions, or want to order any of the goodies I have used to make these cards, please feel free to contact me.